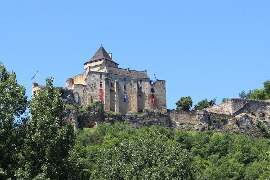 Chateau de Beynac sits high on a rocky promontory 200 metres above the Dordogne River, across which it faces Chateau Castelnaud. 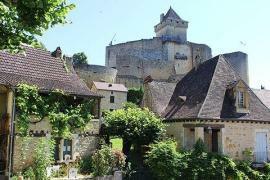 It is a heavily fortified château dating originally from the 12th century but modified, strengthened and altered many times since. The fortifications failed to stop Richard the Lionheart who conquered the castle by scaling the cliff from below. 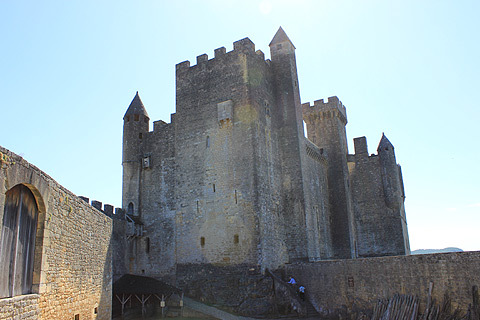 His occupation of the castle was short-lived however - on an adventure against nearby Chateau Chalus soon afterwards he was wounded, and died soon after. 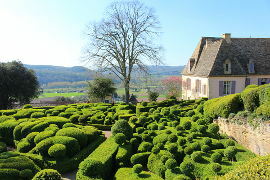 The first thing to notice once you enter the chateau grounds are the fabulous views that you get over the river and the Chateaux of Fayrac, Castelnaud and Marqueysssac. Continuing on into the castle's courtyard you get a close up view of the keep which is where the accommodation is in the castle. Opposite the keep are the stables and the church. 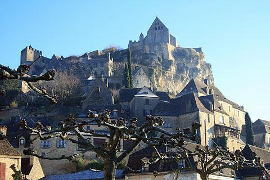 The church is now the church for Beynac and is entered from outside the castle grounds. 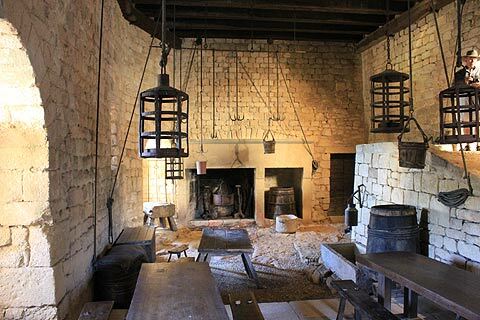 Inside the castle there are interesting dungeons, kitchens and living quarters to explore, and includes features from many ages due to the repeated transformations it underwent. 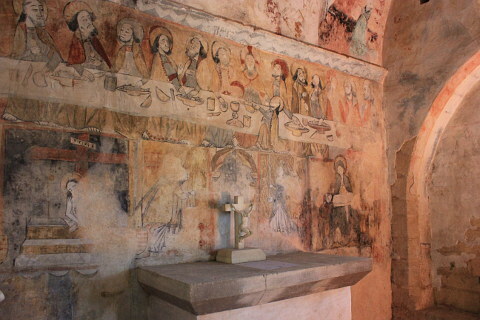 You will admire especially the rare 15th-century frescoes which are in incredibly good condition, an impressive 17th century staircase, and some fine bedrooms and salons, not to mention 13th century toilets! When you climb to the top of the dungeons you get some great views over all the roofs of the castle. Rain falling from these roofs into the central courtyard was collected in large underground tanks and was the drinking water for the castle in medieval times. 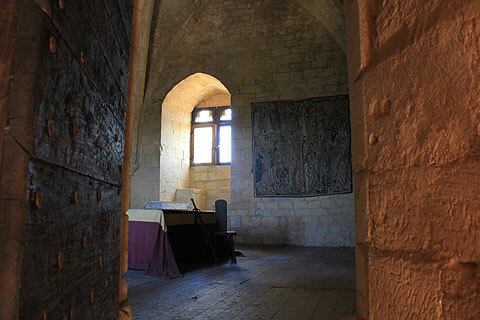 As you walk round the castle you will become aware of the three main periods in the life of the Chateau de Baynac - the 12-13th century, the 14th century and the 17th century. 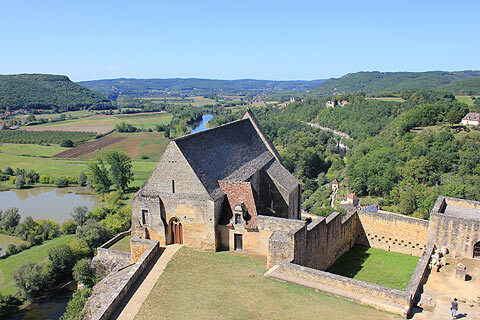 Abandoned from the middle of the 18th century until the second half of the 20th century, Beynac has now undergone a substantial programme of renovation. The castle is privately owned and the owners in conjunction with the Ministry of Culture and Communication have carried out the renovations. Predictably, the castle has a magnificent view of the river and surrounding countryside. 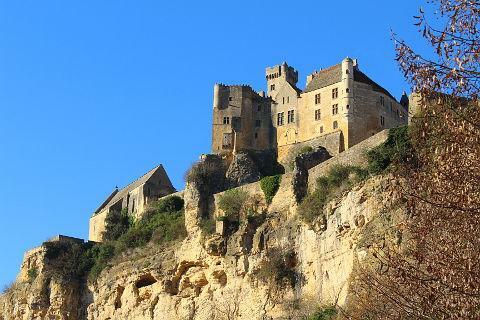 Beynac itself is one of our favourite villages in the Dordogne area. 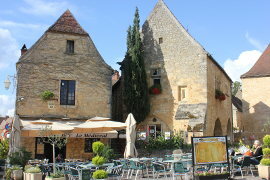 Recent history: the popular French film 'The corridors of time: The Visitors II' included scenes filmed at Beynac Chateau (see other Dordogne films). 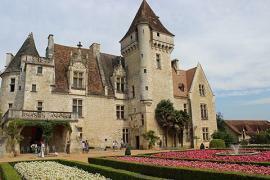 More recently the chateau was used for the filming of Luc Bresson's 'Jean d'Arc'. Rumour has it that Luc and his team caused problems when they were there and left without paying and that now the chateau owners do not like to hear mention of Bresson and his film. I did notice however on my visit some horse shelters with a sign saying they were constucted for the film and so perhaps their differences have been resolved now! 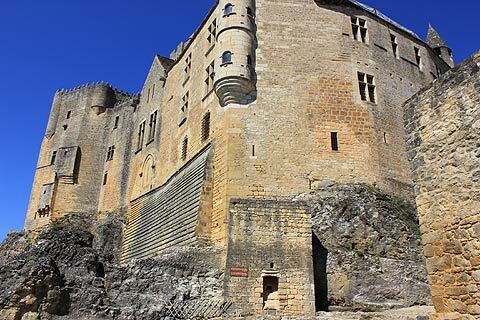 If you are interested in castles then you must visit the nearby Chateau de Castelnaud with its impressive museum of medieval warfare. 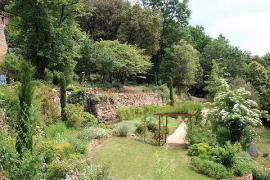 Another great chateau is the Chateau les Milandes. 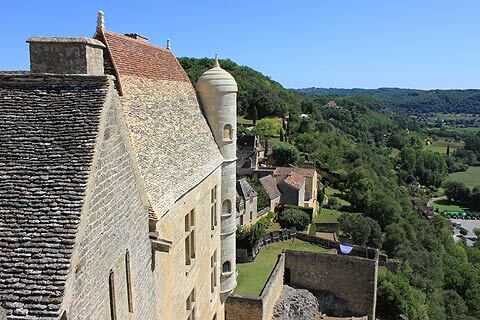 This one though was built for living in rather than for warfare and so provides an interesting contrast to Beynac and Castelnaud. 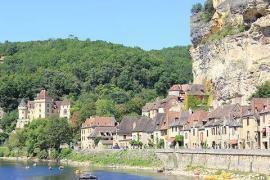 Beynac is in a part of the Dordogne which is positively crammed with beautiful medieval villages such as Domme and La Roque-Gageac and the wonderful town of Sarlat should definitely not be missed.